This is my first Chapter report since taking the helm of the NSW Chapter. It has been a busy number of weeks for me, observing, absorbing and learning. I am looking forward to working with the dedicated Chapter committees and their members, continuing to drive excellent initiatives and programs to the membership. The Gender Equity Taskforce (GET) is at the forefront working hard to formulate initiatives around gender equality in the architecture industry. The Champions of Change program, an initiative of the NSW Chapter, is now is now well underway. The program is facilitated by Dr Jess Murphy and involves nine representatives or Champions, both men and women from medium to large size practices. PALS has also been going exceptionally well. The program is often over-subscribed showing its popularity as a learning forum. Three PALS sessions have already been completed with another four to go in this series. The success of PALS is demonstrated by the number of graduates sitting their exams and their high pass rates. The 2015 Sydney Architecture Festival will be held from 2-5 October. Organised in collaboration with the Architect’s Registration Board, the festival will continue to enable Sydney’s community to participate in and enjoy the architecture of Sydney – past, present and future. Working with Lucy Humphrey and Claire McCaughan of Archrival and John O’Callaghan as the event’s first ever event director team, we are developing an exciting public program – details of which will be announced very soon! We are taking Chapter Council on the road again. Our next excursion will be to Bathurst in September in conjunction with the Country Division Conference We’ve Come So Far, So Far, 22-25 September. This is part of bringing the Chapter Council closer to members – other meetings have been held with the Inner West Architects Network and at Hassell in August. On behalf of the NSW Chapter, I would also like to congratulate and thank everyone involved in this year’s highly successful NSW Architecture Awards. With over 500 guests, the Chapter staged its most successful awards ceremony to date at the Sydney Town Hall. Thank you to all the members who submitted projects, the awards committee, the people who attended and created a wonderful energy in the Town Hall on the presentation night. A special thank you to Chapter staff, Hannah Burgess, Noni, Ela and Dominique for their hard work in making the evening a success. The Newcastle Division has welcomed four new committee members who are proving to be a great asset to our leadership: Rebecca Whan (Jackson Teece), Joel Chamberlain (dwp | Suters), Shane Smede (EJE), and Matthew Travis (Schreiber Hamilton). The University of Newcastle SONA representative, Mr Jiri Loew has also joined our committee which will allow us to better support our student members. We thank Bob Young, Glen Spicer and Sarah Manners for their years of dedicated service to the committee. The Newcastle Division has been active in the preparations for the Lower Hunter Urban Design Awards, 40th Anniversary Awards. This year, as a special anniversary celebration, the awards will be a reflection upon the past four decades of winners. The jury has now completed the assessments, and we look forward to the announcement of the winners at a gala event to be held later this year. This year, our committee is actively looking to strengthen our relationship with the University of Newcastle (UON). The new Head of School of Architecture, Ms Sue-Ann Ware is an enthusiastic supporter of the Institute and we look forward to working with her. As part of our commitment to UON, the Institute has again sponsored the 5th Year Masters of Architecture Exhibition. Our committee is also striving to secure funding for a sequel to the successful 2009 book written by our member, Mr Les Reedman. His book, Early Architects of the Hunter Region, a hundred years to 1940, was funded by the Newcastle Division and is now in its second reprint. If you wish to contribute to the production or the content of the book please contact our office staff. Country Division awards will be presented at the annual conference in Bathurst in September after a record number of entries this year. The conference ‘We’ve come so far, so far’ investigates how architectural history informs the future through a program of speakers, events and workshops. The 2015 events program culminates in a celebration of iconic wool sheds with an exhibition and seminar in the Deeargee Woolshed near Armidale. Over the past couple of months EmAGN DARCH has hosted a series of Tuesdays@Tusculum talks. Following the June announcement of the NSW Student and Graduate Awards recipients for 2015, we invited students from across all four schools of architecture to present their work to the profession. This was an excellent opportunity to hear firsthand about the thinking that went into some of this year’s successful projects and to chat to the award recipients. The projects presented ranged from an archive for the work of JØrn Utzon – this year’s Design Medal winning project – to a habitable bridge on the south coast and several schemes that focused on addressing Australia’s affordable housing crisis. In July we invited David Neustein of Other Architects to co-curate and moderate a Tuesdays@Tusculum panel discussion on the idea of success in architecture. Joining David was Kerry Clare of Clare Designs, Timothy Moore of Sibling, Cristina Goberna of FAKE Industries Architectural Agonism and Tim Horton the NSW Registrar. The talk was structured into three categories, project, practice and career, with the speakers taking turns to discuss each. What was notable was the diversity of approaches and positions taken by the panellists, with each allowing for a different perspective on what constitutes success. Ultimately, the message was clear for the audience: that despite this diversity there was a common thread of engagement, commitment and passion for the profession and that success in architecture can be achieved in many different ways. To keep informed about future events please join the EmAGN DARCH mailing list or find us on Facebook. In July, Allen Jack +Cottier’s (AJ+C) CEO and principal Michael Heenan spoke to a full house as part of the London Festival of Architecture, focusing on Sydney’s future as a world city by the year 2030. AJ+C’s shortlisted projects in the education and residential categories for the 2015 World Architecture Festival Awards were also on display in London, with winners to be announced in Singapore in November. Back home, AJ+C’s Residential Care Facility at Quaker’s Hill has been shortlisted for the UDIA Awards for Excellence. Other recently completed projects include a new multipurpose sports and assembly hall for Abbotsleigh School for girls; a converted inner city warehouse which is attracting a lot of attention with the insertion of a very unusual, insulated and sound proof sleeping pod; and a floating bar atop of Sydney Tower which is the highest event space in the southern hemisphere. AJ+C also continues to work on a number of transformational urban renewal, multi-residential, public and commercial projects in Sydney, Parramatta, Perth and regional NSW. Inner City Warehouse, Allen Jack + Cottier. Photo: Castle+Beatty Photography. PLAY[ground]. Courtesy: HASSELL. Photo: Vin Rathod. Render for Leichhardt Green, Bates Smart. Masterplanning and urban design is a key client service provided by Tanner Kibble Denton Architects (TKD Architects) and a number of projects have now reached major milestones, continuing to form a critical part of the practice workload. After three years of consultation, the $97 million Stage 1 Masterplan DA for St Andrew’s College, within the University of Sydney, was approved by the Central Sydney Planning Committee in December 2014, completing the process that commenced with an invited competition in 2011. In May, a $114 million masterplan was lodged with the NSW Department of Planning and Environment for the staged renewal of the Redlands senior campus at Cremorne and is currently being assessed. TKD Architects continues work on masterplanning for the Parramatta North Urban Transformation site for UrbanGrowth NSW, investigating opportunities for renewal of this significant site. The practice is also focused on several related development applications for the strategic redevelopment of Elaine at Double Bay; a concept masterplan for the redevelopment of Roden Cutler Lodge, Gordon, for Anglican Retirement Villages and a number of school masterplans for the NSW Department of Education. In June HASSELL teamed up with the not for profit organisation Archikidz to create PLAY[ground] – a place that would inspire tomorrow’s thinkers and city makers to play, experiment and toy with ideas about the future of our cities. 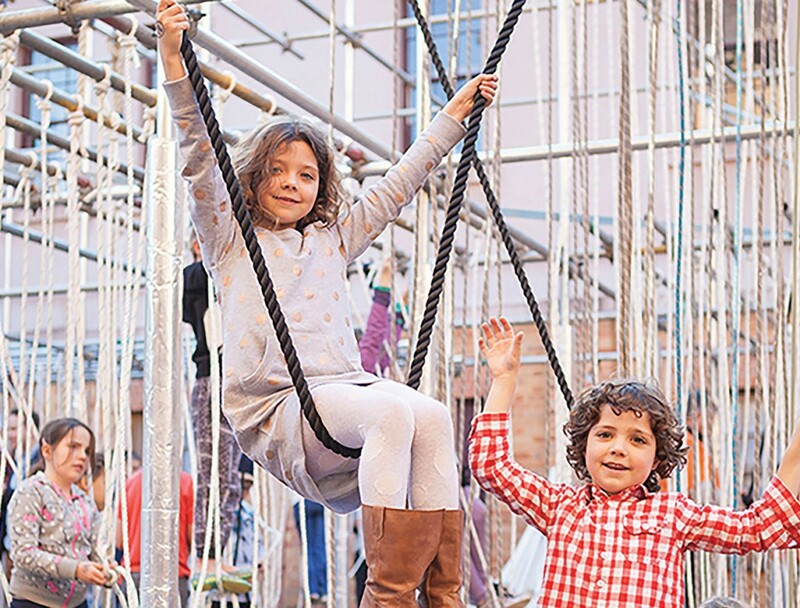 In partnership with Sydney Living Museums, Hyde Park Barracks was transformed by PLAY[ground] into a captivating destination for spontaneous, uninhibited play. The Archikidz brief called for a single playground. But after testing early plans with a group of children, HASSELL created a collection of interactive installations to inspire different types of play featuring multi-coloured ball pools, light-weight structures, and forests of multi-coloured ribbons made from old parachutes. The program for PLAY[ground] included more than 33 workshops about city-making and the built environment. Kids, parents, grandparents and friends immersed themselves in green wall workshops, drew their visions for the future city and experimented with new ways of travelling through the city. At the end of it all, everything was repurposed, returned or recycled to create the ultimate low cost, low impact event. Construction has started at Wharfs Entrance – Mirvac Design’s next stage at Yarra’s Edge, Docklands. The project consists of South Wharf Park, a 30 storey, 228 apartment residential building, 18 waterfront terraces and a recreational facility which consists of gym, pool and café. The recreational facility also features an occupiable green roof that morphs out of the landscape and forms part of the park. Completion of the terraces is slated for 2016 and the apartment building for 2017. 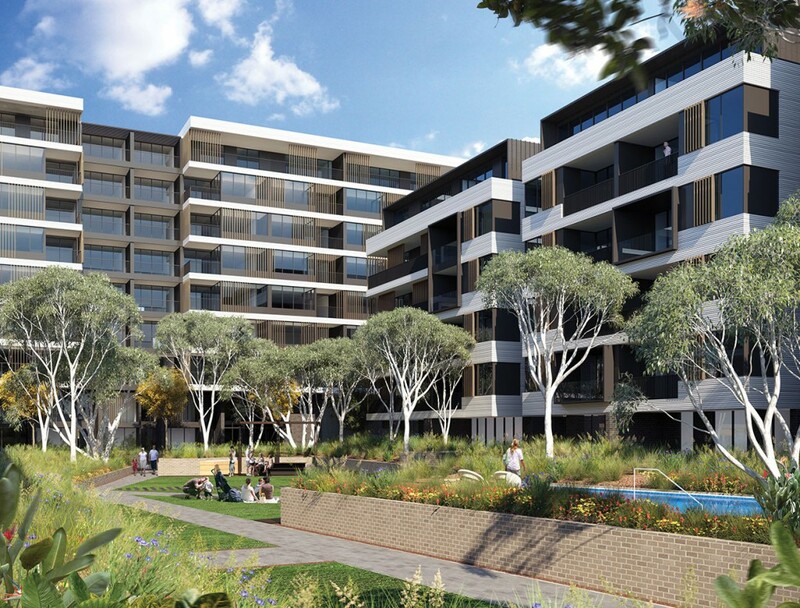 The DA has been approved for the Greenland Group’s Leichhardt Green development, designed by Bates Smart. The project consists of five residential buildings arranged around a landscaped communal courtyard. The individual buildings are articulated to respond to their orientation and the immediate public domain, while connecting with the local context through material and scale. A range of dwelling types from studios to three bedroom terraces have been designed with abundant natural light, views and generous access to the landscaped open space. Two new pedestrian laneways connect the street frontages and the buildings have generous street setbacks. A moderate amount of ground level retail space will activate the through site link and a public piazza. The project is due for completion in 2017.